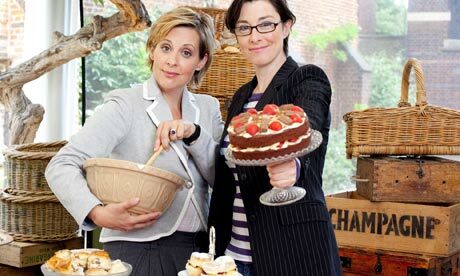 When I first saw The Great British Bake Off advertised last year, I almost burst with excitement. My new-found obsession with baking meant I watched in awe every week, simultaneously wishing I was competing and realising I was nowhere near good enough. As I watched the contestants take on challenge after challenge – from bread, to pastries, macarons, celebration cakes, and pies, I decided to do something I’d been meaning to do for months: write The Bake List. Everyone’s got to have ambitions, right? 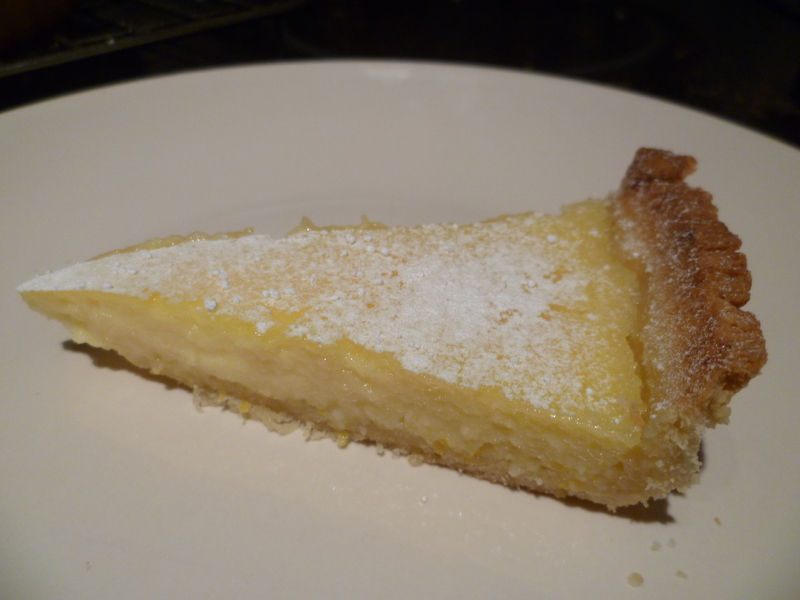 Last week, I got to work ticking off number one – Tarte au Citron. I remembered seeing a picture perfect version of this on the website of last year’s Great British Bake-Off winner Edd Kimber (also know as ‘The Boy who Bakes’) a little while ago, so when the time came, his recipe (click here!) was my first port of call. I haven’t played with pastry very much, apart from very simple mince pies last Christmas, so I was a little apprehensive. Thankfully, the whole point of The Bake List is to expand my horizons and boost my baking confidence! After whipping up the pastry in my food processor (it’s as easy as pie, but don’t worry if you don’t have one, it just takes a little longer! ), I blind-baked it. If you’re like me and grew up devoid of baked good, blind-baking is where the pastry is baked without filling to get a bit of a headstart and cook properly. 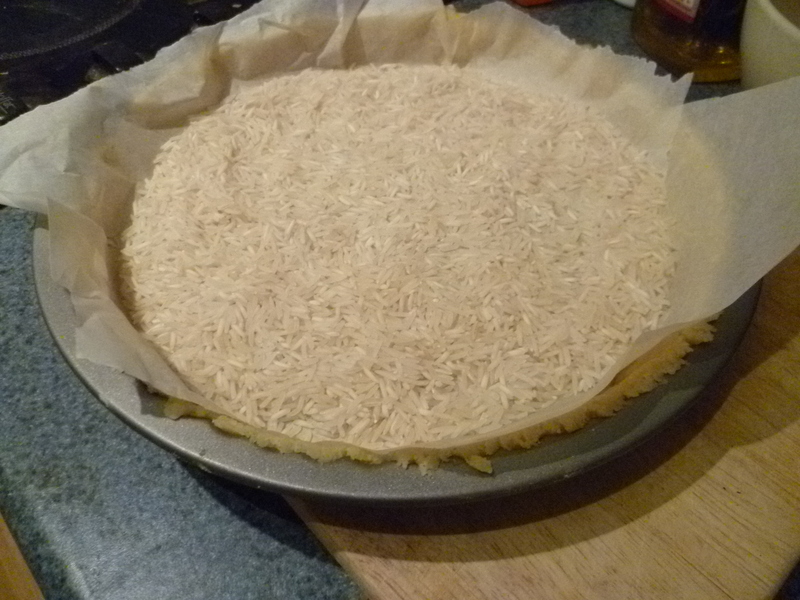 You can buy special baking beans to lie on top of the pastry to stop it bubbling up in the oven, but I went down the simple route of covering in baking parchment and rice – does exactly the same job. Save the rice to use another time to avoid waste! 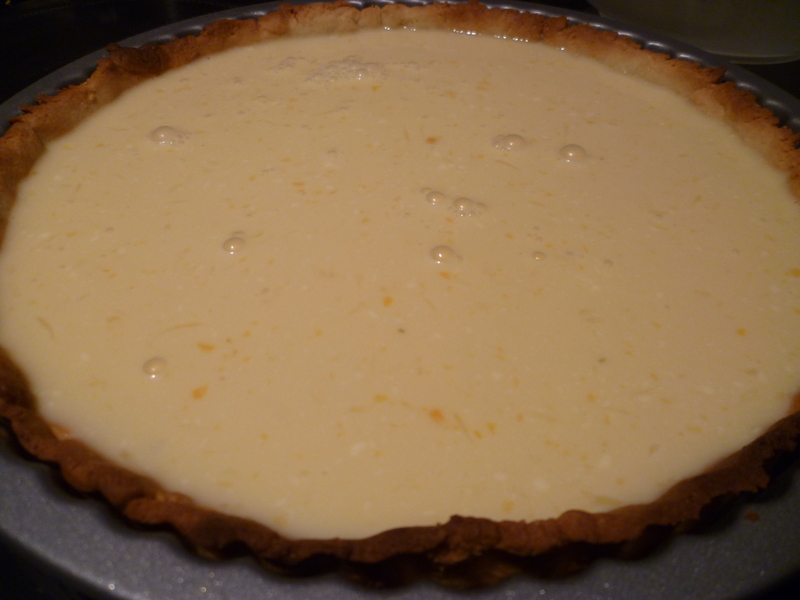 While the pastry was cooling, I gently whipped up the filling – a divine mixture of lemon juice and zest, caster sugar and double cream – before pouring into the cooled pastry case. 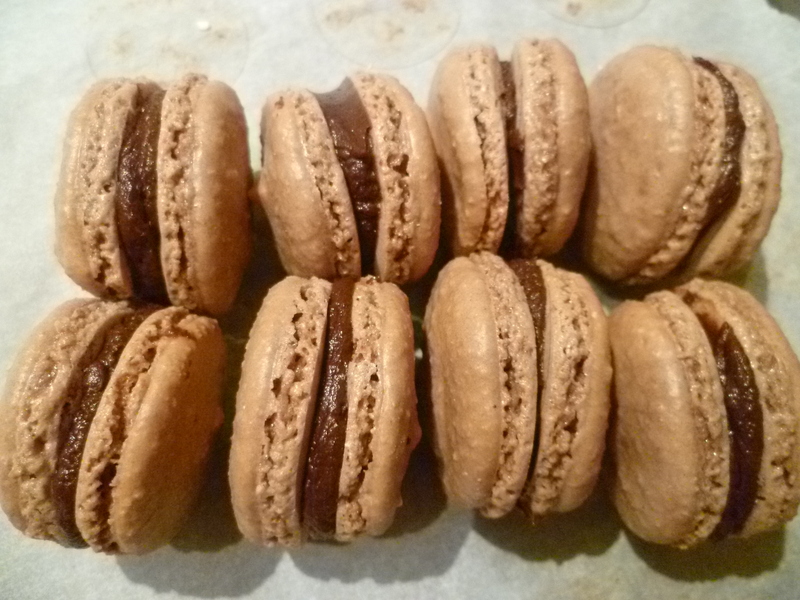 Thankfully, as I was simultaneously making macarons that night, I was so utterly exhausted I managed to keep myself horrifically busy – busy enough not to try a slice until it was almost cold. I fell in lemony love. I was momentarily transported to a balcony overlooking an italian vineyard, the sunshine kissing my skin. The crumbly, almondy pastry, filled with zesty, silky smooth filling. It was heaven. And then – as quick as the last mouthful disappeared – I was back on my sofa, frazzled, surrounded by beautiful, agonizingly small and time-consuming, macaron shells, waiting to be filled and united with their partners. I took it into work and it was as big a hit there as it was for me. Sadly, the unusually full-house of staff meant we were left mourning the consequential lack of seconds. Thank you! Highly recommend giving it a whirl – very easy, too! Both of these look positively delicious! I think I may complie my own Bake List, I like that idea! Re key lime pie, try the recipe in the Hummingbird Bakery Cookbook, I topped mine with Italian meringue and it was to die for!! Your list would look pretty similar to mine lol..! I have been wanting to try these 2 recipes for ages…. will def have to get round to it 🙂 I love the Bake Off as well yay…. Wow! Both look absolutely delicious. I’ve wanted to make something from each episode of the bake-off this year. 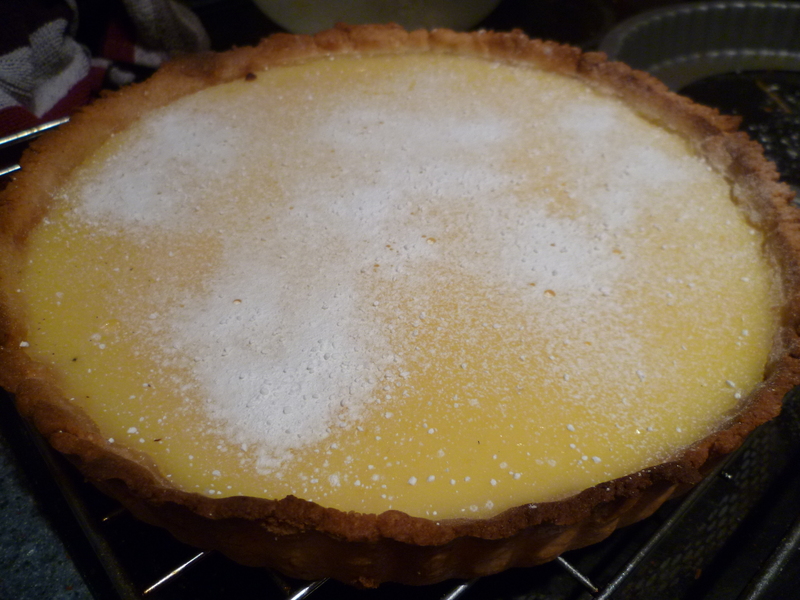 But I wasn’t too bothered about making the Tarte au Citron… however, reading your post and looking at the pictures makes me realise that it would be a very very good idea to give it a go! I don’t have a food processor though, so I will buy one of those first. (I’ve tried making pastry by hand several times before and it’s always been a disaster).